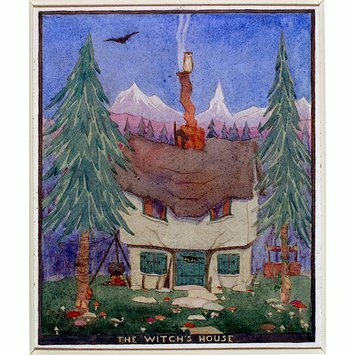 Margaret Tempest's children's book illustrations are characterised by subtle shades of watercolour as seen in this image of a witch's house. Tempest began her illustrating career in the 1920s and is best known as the creator of the children's book characters Little Grey Rabbit and Fuzzypeg the hedgehog. This long-running series of children's books, written by Alison Uttley and published beginning in 1929, are still being re-issued today. Margaret Tempest illustrated the first 30 of these, until 1970. The individual characterisation in her images made them household names. In fact artist and author often disagreed as to who could take the most credit for creating the characters. Tempest also wrote and illustrated 20 books of her own in the 1940s and 1950s, including the Pinky Mouse and Curley Cobbler series. Painting of a thatched cottage set in a garden with toadstools and a well, and situated in a pine forest and mountain landscape. The witch's cauldron stands on a fire to the left of the cottage. The cottage door has an eye-shaped window. An owl sits on the chimney and a spider's web hangs from a nearby pine tree. 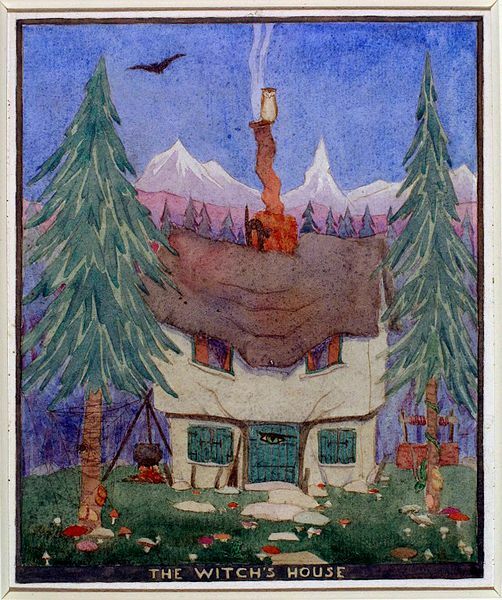 Book illustration, 'The Witch's House', by Margaret Mary Tempest, in watercolour on paper, ca. 1920. Margaret Tempest is best known for her illustrations to Alison Uttley's 'Little Grey Rabbit' stories, but she also illustrated religious books and fairy tales. This is probably an illustration to one of Hans Christian Andersen's stories. The witch's house, with its frowning roof and the eye in the door, is nestled into a forest of fir trees.